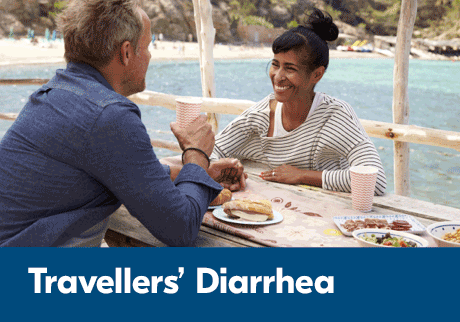 Travellers’ Diarrhea develops after ingesting food or drink that is contaminated by either a bacteria (including E. coli, Salmonella, Shigella and Campylobacter), a virus (such as Norovirus and Rotavirus) or a parasite (Giardia, Crytosporidium, Cyclospora and others). The pathogen can also be transmitted by hand or through objects. Travellers’ diarrhea is defined as the passage of 3 or more loose stools within 24 hours. Preventive measures are the best way to protect yourself against diarrhea related to Traveller’s . In some areas of the world, certain measures are critical. Before taking any over-the-counter medication, always ask the pharmacist if the product is safe for you to take. The information provided is for personal use, reference and education only and is not intended to be a substitute for a Physician’s advice, diagnosis or treatment. Please consult your healthcare professional for specific information on personal health matters.MD/MC 911979 Alberta Ltd. © 2018 Pharmaprix Inc.